Provide comfort for the family of Kathleen Wood with a meaningful gesture of sympathy. Kathleen (Kay) Annie Wood (née Shannon) January 6, 1922 - April 15, 2019. It is with deep sadness that we announce the peaceful passing of Kathleen Wood on the morning of Monday, April 15, 2019 at Credit Valley Hospital in Mississauga, Ontario. Born in Belfast, Ireland, Kathleen moved to Scotland, and then England after she met and became the beloved and loving wife of Stanley Wood (married 56 years), as well as the devoted and much loved mother of daughter Frances. After immigrating to Canada, her family grew with the addition of Frances’ husband Bruce Penny, and she soon became the cherished grandmother of Ian (Jennifer Prince), Sara (Richard Perreault), and Keira, as well as the treasured great grandmother to Benjamin and Michael (Penny Perreault). She was predeceased by her siblings, Jack, Margaret, Lilah, Renee, and Noreena. Kathleen will be fondly missed by her cousin Claire Shaw, her niece (Moira), grand nieces and nephews, great grand nieces and nephews, and their families in Ontario. She is also survived by numerous nieces, nephews, and relatives in Scotland, New Zealand, Australia, and the United States. 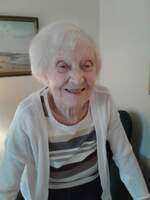 She lived a quietly remarkable life guided by strong principles, an enduring sense of adventure and fun, and the ability to not only adapt, but excel in new situations as evidenced by her military service (WWII), willingness to move across the ocean to Canada in pursuit of a dream, and her strong family bond. With such a well-lived life, the world is a better place for having known her and a poorer place with her loss. Kathleen's family invites relatives and friends to help us celebrate her life at G.H. Hogle Funeral Home, 63 Mimico Ave, Etobicoke. Visitation from 1 - 2:00 p.m. on Saturday, April 27, 2019 with the Memorial Service at 2:00 p.m. Reception to follow. Private inurnment to take place at a later date. Many thanks to her caring doctors and nurses at Credit Valley Hospital and the wonderful team at her Retirement home. In lieu of flowers, the family would appreciate donations in Kathleen’s name to your favourite charities. My condolences to the Wood family during this difficult time. In the Bible, Jehovah God gives us hope. Acts 24:15 says, “there is going to be a resurrection of both the righteous and the unrighteous.” Revelation 21:4 says, “and he will wipe out every tear from their eyes and death will be no more.” Very soon we will see the fulfillment of these promises here on Earth. We hope you find comfort in God’s promises.